The first talking newspaper in the UK was set up in 1969 at Aberystwyth University using the old reel to reel tape recorders. With the advent of the Sony Walkman in the early 70's, which used a plastic cassette to store the tape, this allowed the expansion of Talking Newspapers to other parts of the UK where there are over 450 groups making audio recordings of local newspapers. The Forth Valley Talking Newspaper was started on 13th November 1981. Some of the founding volunteers are still involved, including our chairperson Christine Moroney. Initially the group produced a monthly 90 minute cassette tape using the facilities of Radio Royal at the RSNH in Larbert. This soon changed to fortnightly and in 1983 the tape was produced weekly. In those days the tape consisted of 50 minutes of news and 40 minutes of magazine items. The magazine items were pre-recorded the previous week. In the mid to late 80's production of the tape took place for a short time in two of the volunteers' home (Jackie & Ian Weir) until the group moved to their own premises at Arnotdale in the Dollar Park in Falkirk. To mark the 500th edition of the weekly tape, in February 1994, it was decided to split the magazine and produce it monthly on a separate 60 minute cassette tape. Now listeners were able to hear 90 minutes of news from the Falkirk Herald each week. In 1996 we were fortunate to receive a Lottery Grant, which, with the help of Falkirk Council's architects, enabled us to build and equip 2 recording studios. The 100th edition of the monthly magazine was produced in August 2003 followed by the 1000th edition of the weekly news tape on 15th January 2004. 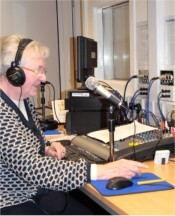 The weekly audio recordings of the news and the monthly magazine is sent out to over 240 visually impaired people in Falkirk District and surrounding areas. The names of most of our new listeners are provided by Falkirk Council's Social Workers for the blind and visually impaired. The emphasis at NEWSLlNE is on producing the weekly news, as soon as possible, after publication of the Falkirk Herald every Thursday. Approximately 20 active volunteers, assisted on alternate weeks by members of Falkirk Soroptimists and Grangemouth & Falkirk Rotary Clubs, meet on a Thursday evening to record, copy and deliver the recordings to the Royal Mail. The process takes about 3 hours. Up until June 2006 we were able to hand in the wallets containing the copy recordings on our way home and the staff at the Royal Mail, Falkirk, hand sorted the wallets overnight so that the audio news recording was delivered with the mail in the FK1 - FK5 area on a Friday morning. Unfortunately, shift patterns changed in June 2006, which means the wallets are not put into the mail system until a Friday morning and are, therefore, not delivered until Saturday. To ensure our Listeners receive a weekly recording we introduced in 2008 a two wallet system - yellow one week and green the next. Therefore, the wallets have two weeks to find their way back to us as our service works on the principle that if the wallet is returned we send the Listener the next recording. With the demise of the cassette tape we have introduced new technology and since 2008 some listeners have been able to receive the weekly audio recording of the news as well as the monthly magazine in CD format. Blank cassette tapes are becoming increasingly difficult to source and the fast copiers we use for tape copying, valued at £22,500, are no longer manufactured, so we are actively moving our Listeners on to CD format. Unfortunately we are unable to fast copy tape (analogue) to CD (digital) format other than in real time and we don't have an extra 90 minutes to spare on a Thursday evening! Therefore, continuing to simultaneously record in both formats can be very fraught on a Thursday evening! In 2006 Age Concern decided that Arnotdale was too big for their requirements and they were also unwilling to spend money altering the building to meet both current fire and disability legislation. This has resulted in both Crossroads and Newsline, after nearly 20 years, being served notice to quit as Falkirk Council had stated to Age Concern that they wished vacant possession of the building. 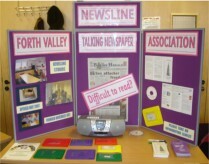 (Crossroads and Newsline were sub-tenants of Age Concern). Given the value of our equipment we decided to move temporarily to Grangemouth Enterprise on 2nd October 2006 before the caretaker vacated the building. Early in 2007 we had a Building Warrant approved for the construction of 3 studios and other necessary alterations in new premises at Cow Wynd in Falkirk. The additional studio enables us to simultaneously record two parts of the weekly news and work on the monthly magazine at the same time. We are fortunate that many of our volunteers have given long years of faithful service to Newsline.